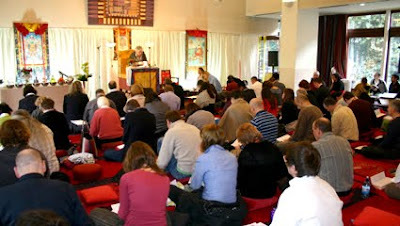 The final days of 2009 saw the annual Mikyo Dorje shedra take place in Manchester. Hosted by the Kagyu Ling sangha, Lama Jampa Thaye taught the first half of the eighth Situ Tenpe Nyinjay’s famed text 'The Instructions of the Supreme Siddhas', a commentary on the third Karmapa Ranjung Dorje's ‘The Prayer of Mahamudra’. Lama Jampa gave a detailed explanation of Situ Panchen’s text, carefully explaining the presentation and defence of Mahamudra contained therein. Lama Jampa concluded the shedra by bestowing the long life initiation of the great adept Thangtong Gyalpo. Alongside Lama Jampa’s teachings, the Dechen dharma school provided some of the younger sangha with an opportunity to learn about the basic tenets of the dharma, with the kind assistance of Kunga. At the end of the main teachings these budding scholars all excelled in the oral examinations conducted by Dechen Dolma and Miranda Moore, and were presented with certificates recognising their achievements by Lama Jampa Thaye. Lama Jampa will teach the concluding half of Situ Panchen’s text at the next Mikyo Dorje shedra in December 2010. Please visit here for further information.